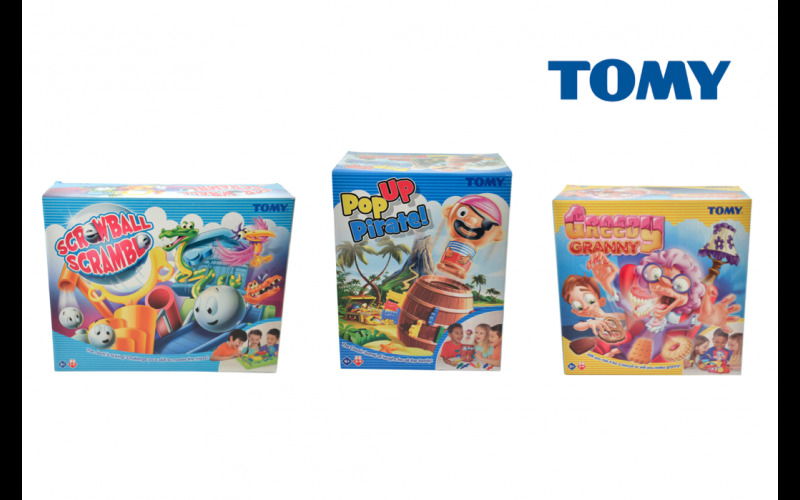 We’ve teamed up with toy giant TOMY to offer 10 lucky readers the chance to win a must have children’s games bundle. You’ll be in with the chance of winning the mischievous Greedy Granny from TOMY’s games range. Perfect for all the family, Greedy Granny is a suspenseful and quirky game that will have everyone on the edge of their seats. Will you risk it for a biscuit? Or will your swift moves wake Granny? Families will also love playing with Pop-Up-Pirate, the classic children’s action game! Take turns to slide your swords into the barrel but be careful as one wrong move will send Black Beard flying. Whose sword will be the first to pop him out of his barrel? Play head-to-head or with up to 4 players. Also up for grabs is family favourite Screwball Scramble! Race to beat the clock as you take on the Screwball Scramble through this topsy-turvy crazy maze! Use skill and coordination to guide the screwball: rock it across a tilting walkway, swing it across with the crane, shimmy over the parallel bars, wobble across the table maze and more! When you’ve finished, catapult the screwball against the bell and stop the clock! Set a time and see if you can go one better! Play solo or challenge your friends to see who can achieve the best time.